, nephew of the preceding, was born A. D. 62, at Novocomum, a town upon the lake Larius, near which he had several beautiful villas. 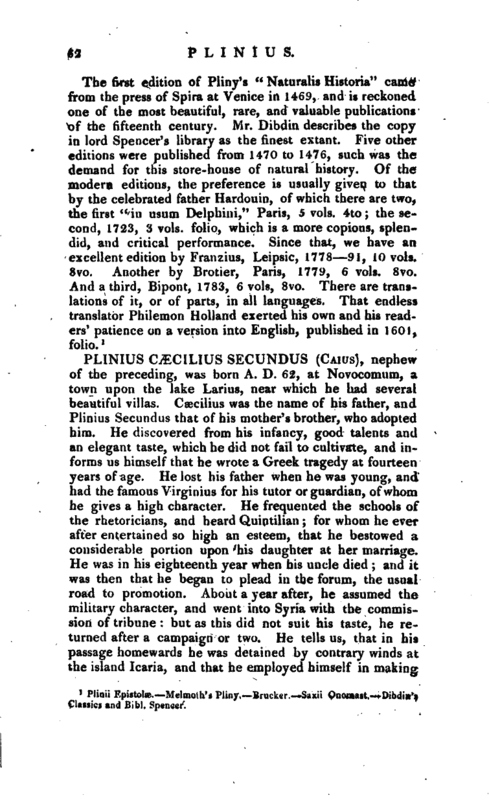 Caecilius was the name of his father, and Plinius Secundus that of his mother’s brother, who adopted him. He discovered from his infancy, good talents and an elegant taste, which he did not fail to cultivate, and informs us himself that he wrote a Greek tragedy at fourteen years of age. He lost his father when he was young, and had the famous Virginius for his tutor or guardian, of whom he gives a high character. He frequented the schools of the rhetoricians, and heard Quintilian; for whom he ever after entertained so high an esteem, that he bestowed a considerable portion upon his daughter at her marriage. He was in his eighteenth year when his uncle died and it was then that he began to plead in the forum, the usual road to promotion. About a year after, he assumed the military character, and went into Syria with the commission of tribune: but as this did not suit his taste, he returned after a campaign or two. He tells us, that in his passage homewards he was detained by contrary winds at the island Icaria, and that he employed himself in making | verses: he enlarges, in the same place, upon his poetical efforts; but in this respect, like Cicero, he valued himself upon a taleftt which he did not eminently possess. Upon his return from Syria, he settled at Rome, in the reign of Domitian. During this most perilous time, he continued to plead in the forum, where he was distinguished, not more by his uncommon abilities and eloquence, than by his great resolution and courage, which enabled him to speak boldly, when hardly any one else could venture to speak at all. On these accounts he was often singled out by the senate, to defend the plundered provinces against their oppressive governors, and to manage other causes of a like important and dangerous nature. One of these causes was in favour of the province of Baetica, in their prosecution of Baebius Massa; in which he acquired so general an applause, that the emperor Nerva, then a private man, and in banishment at Tarentum, wrote him a letter, in which he congratulated, not only Pliny, but the age which had produced an example so much in the spirit of the ancients. 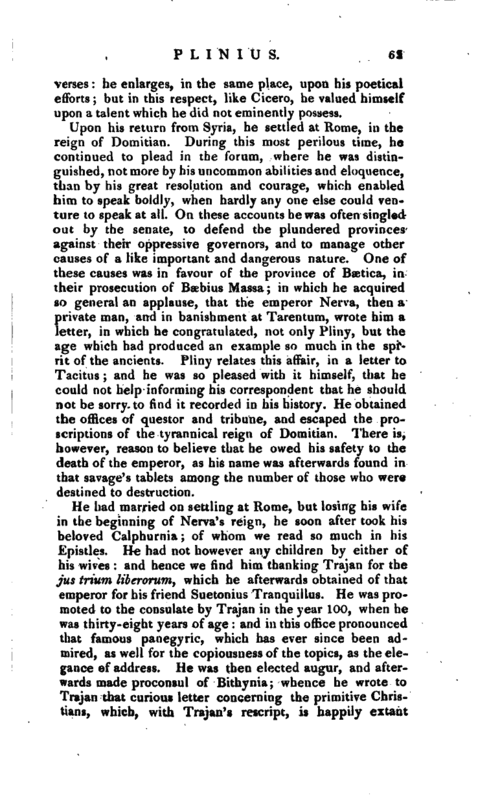 Pliny relates this affair, in a letter to Tacitus; and he was so pleased with it himself, that he could not help informing his correspondent that he should not be sorry to find it recorded in his history. He obtained the offices of questor and tribune, and escaped the proscriptions of the tyrannical reign of Domitian. There is, however, reason to believe that he owed his safety to the death of the emperor, as his name was afterwards found in that savage’s tablets among the number of those who were destined to destruction. He had married on settling at Rome, but losing his wife in the beginning of Nerva’s reign, he soon after took his beloved Calphurnia; of whom we read so much in his Epistles. He had not however any children by either of his wives: and hence we find him thanking Trajan for the jus trium liberorum, which he afterwards obtained of that emperor for his friend Suetonius Tranquillus. He was promoted to the consulate by Trajan in the year 100, when he was thirty-eight years of age: and in this office pronounced that famous panegyric, which has ever since been admired, as well for the copiousness of the topics, as the elegance of address. He was then elected augur, and afterwards made proconsul of Bithynia; whence he wrote to Trajan that curious letter concerning the primitive Christians, which, with Trajan’s rescript, is happily extant | among his “Epistles.” “Pliny’s letter,” as Melmoth observes, in a note upon the passage, “is esteemed as almost the only genuine monument of ecclesiastical antiquity, relating to the times immediately succeeding the apostles, it being written at most not above forty years after the death of St. Paul. It was preserved by the Christians themselves, as a clear and unsuspicious evidence of the purity of their doctrines; and is frequently appealed to by the early writers of the church, against the calumnies of their adversaries.” It is not known what became of Pliny, after his return from Bithynia; nor have we any information as to the time of his death; but it is conjectured that he died either a little before, or soon after, his patron the emperor Trajan, that is, about A. D. 116. 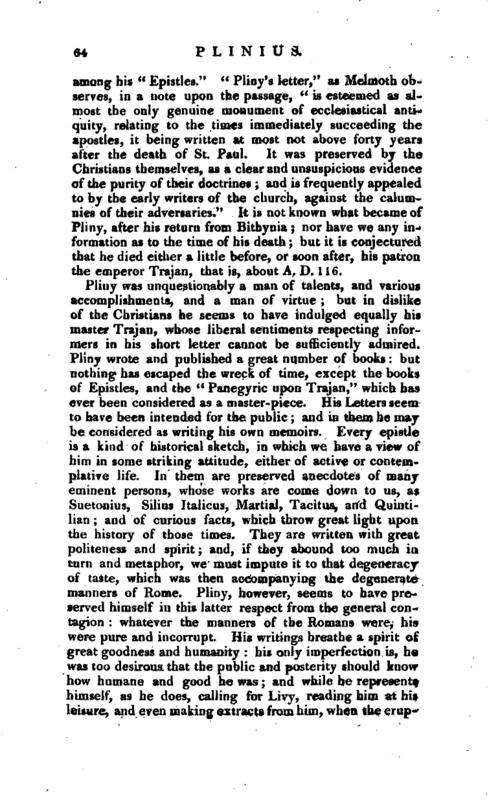 Pliny was unquestionably a man of talents, and various accomplishments, and a man of virtue; but in dislike of the Christians he seems to have indulged equally his master Trajan, whose liberal sentiments respecting informers in his short letter cannot be sufficiently admired. Pliny wrote and published a great number of books: but nothing has escaped the wreck of time, except the books of Epistles, and the “Panegyric upon Trajan,” which has ever been considered as a master-piece. 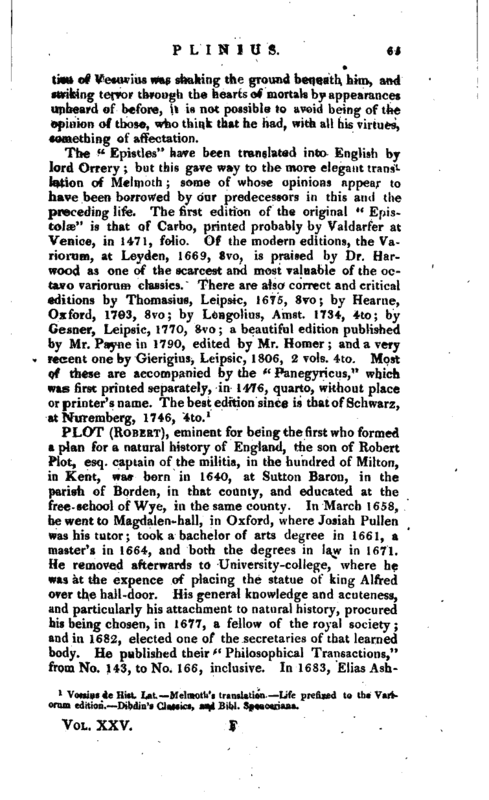 His Letters seem to have been intended for the public; and in them he may be considered as writing his own memoirs. Every epistle is a kind of historical sketch, in which we have a view of him in some striking attitude, either of active or contemplative life. In them are preserved anecdotes of many eminent persons, whose works are come down to us, as Suetonius, Silius Italicus, Martial, Tacitus, and Quintilian; and of curious facts, which throw great light upon the history of those times. They are written with great politeness and spirit; and, if they abound too much in turn and metaphor, we must impute it to that degeneracy of taste, which was then accompanying the degenerate manners of Rome. Pliny, however, seems to have preserved himself in this latter respect from the general contagion: whatever the manners of the Romans were, his were pure and incorrupt. His writings breathe a spirit of great goodness and humanity: his only imperfection is, he was too desirous that the public and posterity should know how humane and good he was; and while he represents himself, as he does, calling for Livy, reading him at his leisure, and even making extracts from him, when the | eruption of Vesuvius was shaking the ground beneath him, antl striking terror through the hearts of mortals by appearances unheard of before, it is not possible to avoid being of the opinion of those, who think that he had, with all his virtues, something of affectation. Vossius de Hist. Lat. Melmoth’s translation. Life prefixed to the Variorum edition. Dibdin’s Classics, and Bibl. Spenceriana.